"Kosygin" redirects here. For other uses, see Kosygin (disambiguation). Alexei Nikolayevich Kosygin (Russian: Алексе́й Никола́евич Косы́гин, tr. Aleksej Nikolajevič Kosygin, IPA: [ɐlʲɪˈksʲej nʲɪkɐˈlajɪvʲɪtɕ kɐˈsɨɡʲɪn]; 21 February [O.S. 8 February] 1904 – 18 December 1980) was a Soviet-Russian statesman during the Cold War. Kosygin was born in the city of Saint Petersburg in 1904 to a Russian working-class family. He was conscripted into the labour army during the Russian Civil War, and after the Red Army's demobilisation in 1921, he worked in Siberia as an industrial manager. Kosygin returned to Leningrad in the early 1930s and worked his way up the Soviet hierarchy. During the Great Patriotic War (World War II), Kosygin was a member of the State Defence Committee and was tasked with moving Soviet industry out of territories soon to be overrun by the German Army. He served as Minister of Finance for a year before becoming Minister of Light Industry (later, Minister of Light Industry and Food). Stalin removed Kosygin from the Politburo one year before his own death in 1953, intentionally weakening Kosygin's position within the Soviet hierarchy. Stalin died in 1953, and on March, 20 1959 Kosygin was appointed to the position of Chairman of the State Planning Committee (Gosplan), a post he would hold for little more than a year. Kosygin next became First Deputy chairman of the Council of Ministers. When Nikita Khrushchev was removed from power in 1964, Kosygin and Leonid Brezhnev succeeded him as Premier and First Secretary respectively. Thereafter, Kosygin formed a troika with Brezhnev and Nikolai Podgorny, the Chairman of the Presidium of the Supreme Soviet, that governed the Soviet Union in Khrushchev's place. During the latter half of the 1960s, Kosygin initially emerged as the most prominent figure in the post-Khrushchev troika. In addition to managing the Soviet Union’s economy, he assumed a preeminent role in the nation’s foreign policy by leading arms control talks with the US and directly overseeing relations with other communist countries. However, the onset of the Prague Spring in 1968 resulted in a severe backlash against his policies that enabled Brezhnev to eclipse him as the dominant figure in the Politburo. While he and Brezhnev disliked one another, he remained in office until being forced to retire on October 23, 1980, due to bad health. He died two months later on December 18, 1980. Kosygin was born into a Russian working-class family consisting of his father and mother (Nikolai Ilyich and Matrona Alexandrovna) and his siblings. The family lived in Saint Petersburg. Kosygin was baptised (7 March 1904) one month after his birth. He was conscripted into a labour army on the Bolshevik side during the Russian Civil War of 1917-1922. After demobilisation from the Red Army in 1921, Kosygin attended the Leningrad Co-operative Technical School and found work in the system of consumer co-operatives in Novosibirsk, Siberia. When asked[when?] why he worked in the co-operative sector of the economy, Kosygin replied, quoting a slogan of Vladimir Lenin: "Co-operation – the path to socialism!" Kosygin stayed there for six years. He applied for a membership in the Communist Party of the Soviet Union in 1927 and returned to Leningrad in 1930 to study at the Leningrad Textile Institute [ru]; he graduated in 1935. After finishing his studies, Kosygin worked as a textile-mill director. Three years later, he was elected Chairman of the Executive Committee of the Leningrad City Soviets of Working People's Deputies by the Leningrad Communist Party, and the following year he was appointed People's Commissar for Textile and Industry and earned a seat on the Central Committee (CC). In 1940 Kosygin became a Deputy chairman of the Council of People's Commissars, and was appointed in 1943 as Chairman of the Council of People's Commissars of the Russian SFSR. Kosygin worked for the State Defence Committee during the Great Patriotic War (World War II). As Deputy Chairman of the Council of Evacuation, he had the task of evacuating industry from territories about to be overrun by the Axis. During the Leningrad Blockade he participated in organising the construction of a supply route and a pipeline on the bottom of Lake Ladoga. Kosygin became a candidate member of the Politburo in 1946, and a full member on 4 September 1948 (toward the end of Joseph Stalin's rule); he lost his seat in 1952. He served as Minister of Finance in 1948, and as Minister of Light Industry from 1949 to 1953. Stalin sent Kosygin to each home[when?] to put their houses into "proper order". Assignments such as these made Kosygin unpopular with certain members of the Soviet leadership. Kosygin told his son-in-law Mikhail Gvishiani, an NKVD officer, of the accusations leveled against his co-worker Nikolai Voznesensky, then Chairman of the State Planning Committee (in office 1942-1949) and a First Deputy Premier (in office 1941-1946), because of his possession of firearms. Gvishiani and Kosygin threw all their weapons into a lake and searched both their own houses for any listening devices. They found one at Kosygin's house, but it might have been installed to spy on Marshal Georgy Zhukov, who had lived there before him. According to his memoirs, Kosygin never left his home without reminding his wife what to do if he did not return from work. After living two years in constant fear, the family reached the conclusion[when?] that Stalin would not harm them. Kosygin, along with Alexey Kuznetsov and Voznesensky, formed a troika in the aftermath of World War II, with high-standing officials such as Stalin promoting all three up the Soviet hierarchy. Kosygin's life, which was connected to Kuznetsov through marriage, was hanging by a thread. How or why Kosygin survived the show trials remains unknown, but, as some jokes say, he "must have drawn a lucky lottery ticket".Nikita Khrushchev blamed Beria and Malenkov for the innocent deaths of Kuznetsov (1 October 1950) and Voznesensky (1 October 1950), and accused Malenkov in 1957 of having concocted a plot so that either Malenkov or Beria would succeed Stalin upon the latter's death. Following Stalin's death in March 1953, Kosygin was demoted, but as a staunch ally of Khrushchev, his career soon turned around. While never one of Khrushchev's protégés, Kosygin quickly moved up the party ladder. Kosygin became an official of the State Planning Committee in 1957, and was made a candidate member of the Politburo. He was promoted to the State Planning Committee chairmanship, and became Khrushchev's First Deputy Premier in 1960. As First Deputy Premier Kosygin travelled abroad, mostly on trade missions, to countries such as North Korea, India, Argentina and Italy. Later, in the aftermath of the Cuban Missile Crisis, Kosygin was the Soviet spokesman for improved relations between the Soviet Union and the United States. Kosygin regained his old seat in the Politburo at the 22nd Party Congress in 1961. When Khrushchev was dismissed as leader in October 1964, Kosygin took over Khrushchev's old post as Premier in what initially was a collective leadership, with Leonid Brezhnev as general secretary and Anastas Mikoyan, and later Nikolai Podgorny, as Chairman of the Presidium. The new Politburo had a more conservative outlook than that found under Khrushchev; Kosygin, Podgorny and Andrei Kirilenko were the most liberal members, Brezhnev and Arvīds Pelše belonged to the moderate faction while Mikhail Suslov retained his leadership of the party's Stalinist wing. In October 1964, at a ceremony in honour of Soviet cosmonauts, Brezhnev called for the strengthening of the Party apparatus. This speech was only the beginning of a large campaign directed against Kosygin. Several newspapers, such as Pravda and Kommunist, criticised the work of the Council of Ministers, and indirectly Kosygin, its chairman, for planning the economy in an unrealistic fashion, and used the highly aggressive rhetoric previously used to condemn Khrushchev against Kosygin. Brezhnev was able to criticise Kosygin by contrasting him with Vladimir Lenin, whom Brezhnev claimed to have been more interested in improving the conditions of Soviet agriculture than improving the quality of light industrial goods. Kosygin's support for producing more consumer goods was also criticised by Brezhnev, and his supporters, most notably Konstantin Chernenko, for being a return to quasi First World policies. At the 23rd Party Congress Kosygin's position was weakened when Brezhnev's supporters were able to increase expenditure on defence and agriculture. However, Brezhnev did not have a majority in the Politburo, and could count on only four votes. In the Politburo Kosygin could count on Kiril Mazurov's vote, and when Kosygin and Podgorny were not bickering with each other, they actually had a majority in the Politburo over Brezhnev. Unfortunately for Kosygin this was not often the case, and Kosygin and Podgorny were constantly disagreeing on policy. Early during Kosygin's tenure, the Brezhnev–Kosygin attempt to create stability was failing on various fronts. From 1969 to 1970 discontent within the Soviet leadership had grown to such an extent that some started to doubt both former and current Soviet policies. Examples include the handling of the Prague Spring and the later Soviet invasion of Czechoslovakia (which Kosygin initially resisted), the decline in agriculture production, the Sino–Soviet border conflict (he advocated restraint), the Vietnam War, and the Soviet–American talks on the limitation of strategic missiles. Two summit conferences between the US and the USSR were held: the Warsaw Pact Summit Conference and the Moscow Summit Conference; both failed to gain support for Soviet policies. By 1970 these differences had not been resolved, and Brezhnev postponed the 24th Party Congress and the Ninth Five-Year Plan (1971–1975). The delay in resolving these issues led to rumours circulating in Soviet society that Kosygin, or even Brezhnev, would lose their posts to Podgorny. By March 1971 it became apparent that Brezhnev was the leader of the country, with Kosygin as the spokesman of the five-year plan and Podgorny's position within the collective leadership strengthened. Early on in his tenure, Kosygin challenged Brezhnev's right as general secretary to represent the country abroad, a function Kosygin believed should fall into the hands of the head of government, as was common in non-communist countries. This was actually implemented for a short period, which led Henry A. Kissinger to believe that Kosygin was the leader of the Soviet Union. Kosygin, who had been the chief negotiator with the First World during the 1960s, was hardly to be seen outside the Second World after Brezhnev consolidated his position within the Politburo, but also due to Andrei Gromyko's dislike of Kosygin meddling into his own ministerial affairs. The Six-Day War in the Middle East had the effect of increasing Soviet–American cooperation; to improve relations even further, the United States Government invited Kosygin to a summit with Lyndon B. Johnson, the President of the United States, following his speech to the United Nations. At the summit, which became known as the Glassboro Summit Conference, Johnson and Kosygin failed to reach agreement on limiting anti-ballistic missile systems, but the summit's friendly and even open atmosphere was referred to as the "Spirit of Glassboro". Relations between the two countries improved further when the 1970 Moscow Treaty was signed on 12 August 1970 by Kosygin and Gromyko and Willy Brandt and Walter Scheel who represented West Germany. In 1972, Kosygin signed a Treaty of Friendship and Cooperation with the government of Iraq, building on strong Soviet ties to the Iraqi Arab Socialist Ba'ath Party and previous close relations with Iraqi leader Abd al-Karim Qasim. Kosygin protected János Kádár's economic reforms and his position as leader of the People's Republic of Hungary from intervention by the Soviet leadership. Polish leader Władysław Gomułka, who was removed from all of his posts in 1970, was succeeded by Edward Gierek who tried to revitalise the economy of the People's Republic of Poland by borrowing money from the First World. The Soviet leadership approved both countries' respective economic experiments, since it was trying to reduce its large Eastern Bloc subsidy programme in the form of cheap oil and gas exports. During the discussions within the Soviet leadership of a possible Soviet invasion of Czechoslovakia Kosygin reminded leaders of the consequences of the Soviet suppression of the 1956 Hungarian revolution. 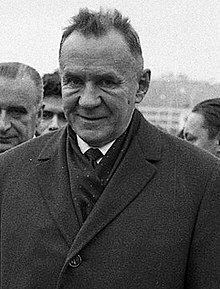 Kosygin's stance became more aggressive later on when he understood that the reforms in Czechoslovakia could be turned against his 1965 Soviet economic reform. — Kosygin speaking at a Politburo session. Kosygin acted as a mediator between India and Pakistan in 1966, and got both nations to sign the Tashkent Declaration. Kosygin became the chief spokesman on the issue of arms control. In retrospect, many of Kosygin's co-workers felt he carried out his work "stoically", but lacked "enthusiasm", and therefore never developed a real taste for international politics. The Sino–Soviet split chagrined Kosygin a great deal, and for a while he refused to accept its irrevocability; he briefly visited Beijing in 1969 due to increased tension between the USSR and China. Kosygin said, in a close-knit circle, that "We are communists and they are communists. It is hard to believe we will not be able to reach an agreement if we met face to face". His view on China changed however, and according to Harold Wilson, former Prime Minister of the United Kingdom, Kosygin viewed China as a "organised military dictatorship" whose intended goal was to enslave "Vietnam and the whole of Asia". During an official visit by an Afghan delegation, Kosygin and Andrei Kirilenko criticised Afghan leaders Nur Muhammad Taraki and Hafizullah Amin for Stalinist-like repressionist behaviour. He promised to send more economic and military aid, but rejected any proposal regarding a possible Soviet intervention, as an intervention in Afghanistan would strain the USSR's foreign relations with the First World according to Kosygin, most notably West Germany. However, in a closed meeting, without Kosygin, who strongly opposed any kind of military intervention, the Politburo unanimously supported a Soviet intervention. The Eighth Five-Year Plan (1966–1970) is considered to be one of the most successful periods for the Soviet economy and the most successful when it comes to consumer production (see The "Kosygin" reform). It became to be known as the "golden era". The 23rd Party Congress and the Ninth Five-Year Plan (1971–1975) had been postponed by Brezhnev due to a power struggle within the Soviet leadership. At the 23rd Party Congress Kosygin promised that the Ninth Five-Year Plan would increase the supply of food, clothing and other household appliances up to 50 percent. The plan envisaged a massive increase in the Soviet standard of living, with Kosygin proclaiming a growth of 40 percent for the population's cash income in his speech to the congress. The Tenth Five-Year Plan (1976–1981) was referred to by Kosygin as the "plan of quality". Brezhnev rejected Kosygin's bid for producing more consumer goods during the Tenth Five-Year Plan. Because of it the total volume of consumer goods in industrial production only stood at 26 percent. Kosygin's son-in-law notes that Kosygin was furious with the decision, and proclaimed increased defence expenditure would become the Soviet Union's "complete ruin". The plan was less ambitious than its predecessors, with targets of national industrial growth no higher than what the rest of the world had already achieved. Soviet agriculture would receive a share investment of 34 percent, a share much larger than its proportional contribution to the Soviet economy, as it accounted for only 3 percent of Soviet GDP. Like Khrushchev, Kosygin tried to reform the command economy within a socialist framework. In 1965 Kosygin initiated an economic reform widely referred to as the "Kosygin reform". Kosygin sought to make Soviet industry more efficient by including some market measures common in the First World such as profit making for instance; he also tried to increase quantity of production, increase incentives for managers and workers, and freeing managers from centralised state bureaucracy. The reform had been proposed to Khrushchev in 1964, who evidently liked it and took some preliminary steps to implement it. Brezhnev allowed the reform to proceed because the Soviet economy was entering a period of low growth. In its testing phase, the reform was applied to 336 enterprises in light industry. The reform was influenced by the works of Soviet economist Evsei Liberman. Kosygin overestimated the ability of the Soviet administrative machine to develop the economy, which led to "corrections" to some of Liberman's more controversial beliefs about decentralisation. According to critics, Kosygin's changes to Liberman's original vision caused the reform to fail. Kosygin, who had for a long time been conscious of the First World's superiority, believed that decentralisation, semi-public companies, and cooperatives were keys to catching up. His reform sought a gradual change from a "state-administered economy" to an economy in which "the state restricts itself to guiding enterprises". The reform was implemented, but showed several malfunctions and inconsistencies early on. The salary for Soviet citizens increased abruptly by almost 2.5 times during the plan. Real wages in 1980 amounted to 232.7 rubles, compared to 166.3 rubles before the 1965 Soviet economic reform and the Eighth Five-Year Plan. The first period, 1960–1964, was characterised by low growth, while the second period, 1965–1981, had a stronger growth rate. The second period vividly demonstrated the success of the Kosygin reform, with the average annual growth in retail turnover being 11.2 billion rubles, 1.8 times higher than in the first period and 1.2 times higher than the third period (1981–1985). Consumption of goods and daily demand also increased. The consumption of home appliances greatly increased. Refrigerators increased from a low of 109,000 in 1964 to 440,000 units by 1973; consumption declined during the reversal of the reform. Car production increased, and would continue to do so until the late 1980s. The Soviet leadership, under pressure, sought to provide more attractive goods for Soviet consumers. The removal of Khrushchev in 1964 signalled the end of his "housing revolution". Housing construction declined between 1960 and 1964 to an average of 1.63 million square metres. Following this sudden decrease, housing construction increased sharply between 1965 and 1966, but dropped again, and then steadily grew (the average annual growth rate was 4.26 million square metres). This came largely at the expense of businesses. While the housing shortage was never fully resolved, and still remains a problem in present-day Russia, the reform overcame the negative trend and renewed the growth of housing construction. Growing hostility towards reform, the poor results, and Kosygin's reformist stance, led to a popular backlash against him. Kosygin lost most of the privileges he had enjoyed before the reform, but Brezhnev was never able to remove him from the office of Chairman of the Council of Ministers, despite his weakened position. In the aftermath of his failed reform, Kosygin spent the rest of his life improving the economic administration through the modification of targets; he implemented various programmes to improve food security and ensure the future intensification of production. There is no proof to back up the claim that the reform itself contributed to the high growth seen in the late-1960s, and that its cancellation had anything to do with the stagnating growth of the economy which began in the 1970s. Kosygin initiated another economic reform in 1973 with the intentions of weakening the central Ministries and giving more powers to the regional authorities in republican and local-levels. The reform's failure to meet Kosygin's goal led to its cancellation. However, the reform succeeded in creating associations, an organisation representing various enterprises. The last significant reform undertaken by the pre-perestroika leadership was initiated by Kosygin's fifth government in a joint decision of the Central Committee and the Council of Ministers. The "Improving planning and reinforcing the effects of the economic mechanism on raising the effectiveness in production and improving the quality of work", more commonly known as the 1979 reform. The reform, in contrast to the 1965 reform, was intended to increase the central government's economic involvement by enhancing the duties and responsibilities of the ministries. Due to Kosygin's resignation in 1980, and because of Nikolai Tikhonov's conservative approach to economics, very little of the reform was actually implemented. By the early to mid-1970s Brezhnev had established a strong enough power base to effectively become leader. According to historian Ilya Zemtsov, the author of Chernenko: The Last Bolshevik: The Soviet Union on the Eve of Perestroika, Kosygin "began to lose power" with the 24th Party Congress in 1971 which for the first time publicised the formula 'the Politburo led by Brezhnev'". Along with weakening Kosygin's position, Brezhnev moved to strengthen the Party's hold on the Government apparatus, weakening Kosygin's position further. Historian Robert Wesson, the author of Lenin's Legacy: The Story of the CPSU, notes that Kosygin's economic report to the 25th Party Congress "pointed even more clearly to the end of struggle" between Brezhnev and Kosygin. Kosygin was further pushed aside when Brezhnev published his memoirs, which stated that Brezhnev, not Kosygin, was in charge of all major economic decisions. To make matters worse for Kosygin, Brezhnev blocked any future talks on economic reform within the party and government apparatus, and information regarding the reform of 1965 was suppressed. Brezhnev consolidated his own position over the Government Apparatus by strengthening Podgorny's position as Chairman of the Presidium of the Supreme Soviet, literally head of state, by giving the office some of the functions of the Premier. The 1977 Soviet Constitution strengthened Podgorny's control of the Council of Ministers, by giving the post of head of state some executive powers. In fact, because of the 1977 Soviet Constitution, the Council of Ministers became subordinate to the Presidium of the Supreme Soviet. When Podgorny was replaced as head of state in 1977 by Brezhnev, Kosygin's role in day-to-day management of government activities was lessened drastically, through Brezhnev's new-found post. Rumours started circulating within the top circles, and on the streets, that Kosygin would retire due to bad health. Brezhnev's consolidation of power weakened Kosygin's influence and prestige within the Politburo. Kosygin's position was gradually weakened during the 1970s and he was frequently hospitalised. On several occasions Kiril Mazurov, the First Deputy chairman of the Council of Ministers, had to act on his behalf. Kosygin suffered his first heart attack in 1976. After this incident, it is said that Kosygin changed from having a vibrant personality to being tired and fed up; he, according to people close to him, seemed to have lost the will to continue his work. He twice filed a letter of resignation between 1976 and 1980, but was turned down on both occasions. During Kosygin's sick leave, Brezhnev appointed Nikolai Tikhonov to the post of First Deputy Chairman of the Council of Ministers. Tikhonov, as with Brezhnev, was a conservative, and through his post as First Deputy chairman Tikhonov was able to reduce Kosygin to a standby role. At a Central Committee plenum in June 1980, the Soviet economic development plan was outlined by Tikhonov, not Kosygin. The powers of the Premier diminished to the point where Kosygin was forced to discuss all decisions made by the Council of Ministers with Brezhnev. Kosygin was hospitalised in October 1980; during his stay Kosygin wrote a brief letter of resignation; the following day he was deprived of all government protection, communication, and luxury goods he had earned during his political life. Kosygin died on 18 December 1980; none of his Politburo colleagues, former aides, or security guards visited him. At the end of his life, Kosygin feared the complete failure of the Eleventh Five-Year Plan (1981–1985), claiming that the sitting leadership was reluctant to reform the stagnant Soviet economy. His funeral was postponed for three days, as Kosygin died on the eve of Brezhnev's birthday, and the day of Stalin's. He was buried in Red Square, Moscow. Kosygin was praised by Brezhnev as an individual who "laboured selflessly for the good of the Soviet state". A state funeral was conducted and Kosygin was honoured by his peers; Brezhnev, Yuri Andropov, and Tikhonov laid an urn containing his ashes at the Kremlin Wall. Compared to other Soviet officials, Kosygin stood out as a pragmatic and relatively independent leader. In a description given by an anonymous high-ranking GRU official, Kosygin is described as "a lonely and somewhat tragic figure" who "understood our faults and shortcomings of our situation in general and those in our Middle East policy in particular, but, being a highly restrained man, he preferred to be cautious." An anonymous former co-worker of Kosygin said "He always had an opinion of his own, and defended it. He was a very alert man, and performed brilliantly during negotiations. He was able to cope quickly with the material that was totally new to him. I have never seen people of that calibre afterwards." Canadian Prime Minister Pierre Trudeau said Kosygin was like "Khrushchev without the rough edges, a fatherly man who was the forerunner of Mikhail Gorbachev". He noted that Kosygin was willing to discuss issues so long that the Soviet position was not tackled head-on. Former United States Secretary of State Henry A. Kissinger said that Kosygin was devoted, nearly fanatically, to his work. Kosygin was viewed by Western diplomats as a pragmatist "with a glacial exterior who was orthodox if not rigid". Andrei Sakharov, a Soviet dissident, believed Kosygin to be "the most intelligent and toughest man in the Politburo". Kosygin would prove to be a very competent administrator, with the Soviet standard of living rising considerably due to his moderately reformist policy. Kosygin's moderate 1965 reform, as with Nikita Khrushchev's thaw, radicalised the Soviet reform movement. While Leonid Brezhnev was content to maintain the centralised structure of the Soviet planned economy, Kosygin attempted to revitalise the ailing economic system by decentralising management. Following Brezhnev's death in 1982, the reform movement was split between Yuri Andropov's path of discipline and control and Gorbachev's liberalisation of all aspects of public life. Chernenko: The Last Bolshevik: The Soviet Union on the Eve of Perestroika author Ilya Zemtsov describes Kosygin as a "Determined and intelligent, an outstanding administrator" and claims he distinguished himself from the other members of the Soviet leadership with his "extraordinary capacity for work". Historians Moshe Lewin and Gregory Elliott, the authors of The Soviet Century, describe him as a "phenomenal administrator". "His strength", David Law writes, was "his exceptional capability as an administrator". According to Law Kosygin proved himself to be a "competent politician" also. Historians Evan Mawdsley and Stephen White claim that Brezhnev was unable to remove Kosygin because his removal would mean the loss of his last "capable administrator". In their book, The Unknown Stalin, Roy Medvedev and Zhores Medvedev called Kosygin an "outstanding organiser", and the "new Voznesensky". Historian Archie Brown, the author The Rise & Fall of Communism, believes the 1965 Soviet economic reform to have been too "modest", and claimed that Kosygin "was too much a product of the Soviet ministerial system, as it evolved under Stalin, to become a radical economic reformer". However, Brown does believe that Kosygin was "an able administrator". Gvishiani, a Russian historian, concluded that "Kosygin survived both Stalin and Khrushchev, but did not manage to survive Brezhnev." Kosygin was viewed with sympathy by the Soviet people, and is still presently viewed as an important figure in both Russian and Soviet history. Because of Kosygin's popularity among the Soviet people, Brezhnev developed a "strong jealousy" for Kosygin, according to Nikolai Egorychev. Mikhail Smirtyukov, the former Executive Officer of the Council of Ministers, recalled that Kosygin refused to go drinking with Brezhnev, a move which annoyed Brezhnev gravely. Nikolai Ryzhkov, the last Chairman of the Council of Ministers, in a speech to the Supreme Soviet of the Soviet Union in 1987 referred to the "sad experiences of the 1965 reform", and claimed that everything went from bad to worse following the reform's cancellation. During his lifetime, Kosygin received seven Orders and two Awards from the Soviet state. He was awarded two Hero of Socialist Labour (USSR); one being on his 60th birthday by the Presidium of the Supreme Soviet in 1964, on this occasion he was also awarded an Order of Lenin and a Hammer and Sickle Gold Medal. On 20 February 1974, to commemorate his 70th birthday, the Presidium of the Supreme Soviet awarded him another Order of Lenin and his second Hammer and Sickle Gold Medal. In total, Kosygin was awarded six Orders of Lenin by the Soviet state, and one Order of the October Revolution and one Order of the Red Banner of Labour. During a state visit to Peru in the 1970s with Leonid Brezhnev and Andrei Gromyko, all three were awarded the Grand Cross of the Order of the Sun by President Francisco Morales Bermúdez. The Moscow State Textile University was named in his honour in 1981, in 1982 a bust to honour Kosygin was placed in Leningrad, present day Saint Petersburg. In 2006 the Russian Government renamed a street after him. ^ a b c d Алексей Гвишиани: "Не надо жалеть Косыгина!" [Alex Gvishiani: "Do not feel sorry for Kosygin!"] (in Russian). Pravda Online. 9 April 2004. p. 3. Retrieved 4 September 2010. ^ Tucker, Spencer C.; Roberts, Priscilla (12 May 2008). "Kosygin, Alexei". The Encyclopedia of the Arab-Israeli Conflict: A Political, Social, and Military History [4 volumes]: A Political, Social, and Military History. ABC-CLIO. ISBN 9781851098422. ^ a b Law 1975, p. 221. ^ Андриянов, Виктор (23 August 2003). Неизвестный Косыгин [The Unknown Kosygin]. Rossiyskaya Gazeta (in Russian). Retrieved 4 September 2010. ^ Society for Contemporary Studies 1979, p. 15. ^ a b c d e Law 1975, p. 222. ^ Safire 1988, p. 610. ^ a b Алексей Николаевич Косыгин [Alexei Nikolayevich Kosygin] (in Russian). Moscow State Textile University. 27 November 2008. Archived from the original on 10 August 2010. Retrieved 5 September 2010. ^ a b c d Алексей Гвишиани: "Не надо жалеть Косыгина!" [Alex Gvishiani: "Do not feel sorry for Kosygin!"] (in Russian). Pravda Online. 9 April 2004. Archived from the original on 11 August 2010. Retrieved 4 September 2010. ^ a b c d e f g Elliott & Lewin 2005, p. 248. ^ Moss 2005, p. 247. ^ a b "Suddenly Nikita's day was done". Life. 23 October 1964. p. 35. ^ a b c d Z. Medvedev & R. Medvedev 2006, p. 48. ^ Elliott & Lewin 2005, p. 95. ^ Elliott & Lewin 2005, p. 96. ^ "Life Hung by a Thread". Life. 11 December 1970. p. 59. ^ Service 2009, p. 377. ^ a b c d e Law 1975, p. 211. ^ Zemtsov 1989, p. 86. ^ Zemtsov 1989, p. 102. ^ a b c Brown 2009, p. 403. ^ a b Van Dijk 2008, p. 525. ^ Gibbons 1995, pp. 718–719. ^ Robbins 2010, p. 73. ^ Dannenberg 2008, p. 33. ^ Coughlin 2005, p. 106. ^ Harrison & Cordovez 1995, pp. 36–37. ^ a b Zubok 2007, pp. 194–195. ^ Colman 2004, p. 125. ^ Daniels 1993, p. 65. ^ Daniels 1993, p. 302. ^ Rutland 1985, p. 137. ^ Ploss 2010, p. 171. ^ a b c Wesson 1978, p. 253. ^ a b Moss 2005, p. 431. ^ a b Chauhan 2004, p. 207. ^ Wesson 1978, p. 240. ^ Elliott & Lewin 2005, p. 249. ^ Анализ динамики показателей уровня жизни населения [Analysis of the dynamics of living standards] (in Russian). Moscow State University. Retrieved 4 September 2010. ^ a b Травин, Дмитрий. Алексей Николаевич Косыгин [Alexei Nikolayevich Kosygin] (in Russian). peoples.ru. Retrieved 20 September 2010. ^ Sandle & Bacon 2002, p. 58. ^ Dellenbrant 1986, pp. 74–75. ^ Wesson 1978, p. 254. ^ a b "Soviet Union: And Then There Was One". Time. 3 November 1980. Retrieved 21 January 2011. ^ a b Zemtsov 1989, p. 105. ^ Вергасов, Фатех. Организация здорового накала [The Healthy Glow of Organisation] (in Russian). pseudology.org. Retrieved 4 September 2010. ^ "World: Lonely Death of a Survivor". Time. 29 December 1980. p. 1. Retrieved 21 January 2011. ^ Saikal 2006, p. 293. ^ Bothwell & Granatstein 1991, p. 193. ^ "World: Lonely Death of a Survivor". Time. 29 December 1980. p. 2. Retrieved 21 January 2011. ^ Zemtsov 1989, pp. 86–87. ^ a b Mawdsley & White 2000, p. 272. ^ Ellman 1989, p. 73. ^ a b Staff writer. Косы́гин, Алексе́й Никола́евич [Kosygin, Alexei Nikolayevich] (in Russian). warheroes.ru. Retrieved 18 April 2011. ^ Central Asian Research Centre 1979, p. 64.